Books are ideal Christmas presents. And as I am spending some time dealing with family business I thought reposting some of my past book reviews over the next few days could be useful am repeating some of my past book reviews. Another one on climate change – but this time discussing the science, politics and psychology of science denialism. I think this book has three messages, but two of them resonated strongly with me. Effectively these are the title and subtitle. The problems presented by global warming are so large we may never solve them (hence Requiem for a Species – us). The more I discover about the science of climate change the more I become aware that if we don’t take protection measures soon the results for our species will be dramatic. Socially and psychologically we want to deny the problem (Hence Why we Resist the Truth About Climate change). Psychological and sociologically, as individuals and collectively, we are in denial. This inhibits our capacity to take the actions needed to protect us from the results of human induced climate change. Those messages come through strongly. The third message, ideas and suggestions for getting us out of these problems is far weaker, probably because it is less specific. I am currently reading Clive Hamilton‘s book “Requiem for a Species: Why We Resist the Truth About Climate Change. ” This figure in the book intrigued me. It’s taken from the report Global Warming’s Six Americas: An Audience Segmentation Analysis. I think this demonstrates clearly that much of the public debate on climate change is politically based. Too often the real issue for those who argue against the science of climate change is political or ideological. The actions required to deal with climate change are seen as a threat to “free enterprise” because they require collective action to restrain the self-interest of individuals. I just wish people with these concerns would be honest and stop trying to discredit the science and the scientists. After all, one can’t change reality, and it is only sensible to deal with the real issues. To deal with the politics. As I argued in Liability of scientific denialism to political conservativism attempts to discredit the science are really only a cop-out from the real political issues. By the way – you shouldn’t read the wrong things into the above figure. 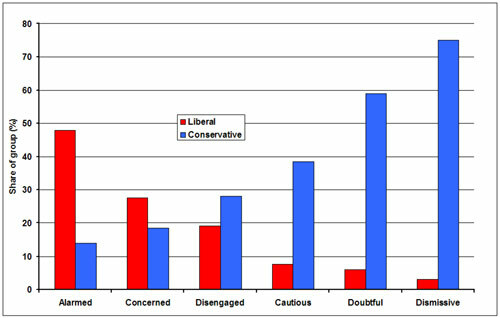 The data is simply displaying the proportion of each classification (Alarmed, to Dismissive) who were liberal or conservative. “Moderates” are not shown hence the totals are less than 100. The figure does not indicate what proportion of the population is in each classification. Another figure from this report gives this information (see below). As you can see only a small proportion of the American population is dismissive or doubtful about climate change.